Iron Man and Hulk: Heroes United DVD (2014) Eric RadomskiTitle: Iron Man and Hulk: Heroes United Leading Actor: Eric Radomski Region: Region 2 Duration: 68 mins Format: DVD / Normal Type: DVD No. of Discs: 1 disc(s) Studio / Publisher: WDHE UK Release Date: 24 Feb 2014 Edition: Normal. Zoom > Teenage Mutant Ninja Turtles: Earth's Last Stand/Super. 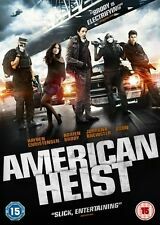 [DVD]. 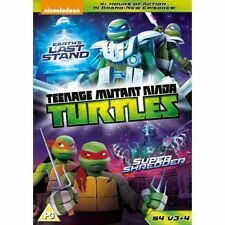 Product Teenage Mutant Ninja Turtles: Earth's Last Stand/Super. [DVD]. They’ve studied relentlessly. They’ve mastered their craft. All in High Definition! Blu ray is in excellent condition. DVD Release Date: 27 July 2015. · Clean Opening Animation. · Clean Closing Animation. A strange girl washes up on shore naked, unable to communicate, scared and alone. With an ever growing catalogue of films, we pride ourselves on the high quality and diverse subject matter of our movies, from big budget star led features to lower budget independent productions - ensuring our continued success and keeping us at the forefront of UK film distribution. The Place Beyond The Pines [NEW & SEALED] Brand New And Factory Sealed DVD Disc type : DVD Region : DVD : 2 Format : PAL (UK Standard) Catalogue Reference : OPTD2330 Condition New as in the photograph Payment with Paypal Only. Our reference : Store-60545 We only offer genuine products. To see the product you're purchasing, please refer to the photograph. Feature-length animated adventure set in a Lego version of the DC universe. Once there the destructive clone forms his own rival group of superheroes to fight back. It only takes a minute, doesn't cost you anything and it's really very much appreciated! 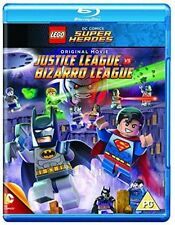 LEGO Batman - The Movie - DC Super Heroes Unite Blu-ray (2014) Jon BurtonTitle: LEGO Batman - The Movie - DC Super Heroes Unite Leading Actor: Jon Burton Region: Region ABC Duration: 68 mins Format: Blu-ray / Normal Type: Blu-ray No. IRON MAN / HULK. HEROES UNITED. Jewel case remains factory sealed. 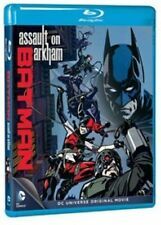 Batman: Assault On Arkham DVD (2014) Jay Oliva NEW Title: Batman: Assault On Arkham Leading Actor: Jay Oliva Region: Region ABC Format: Blu-ray / Normal Type: Blu-ray No. Animated feature from Jay Olivia and Ethan Spaulding. UK CERTIFICATE: 15. LANGUAGE: ENGLISH. Region Code All UK DVD's tend to be Region Code 2 or Zero (All regions). Neither submitting an electronic order form or completing the checkout process constitutes our acceptance of your order. Title: Elfen Lied: Complete Collection. Missing Information?. Condition: New. WORLD WAR Z STEELBOOK BLU-RAY BRAND NEW SEALED! UNOPENED! Once there the destructive clone forms his own rival group of superheroes to fight back. Title: LEGO: Justice League Vs Bizarro League. Condition: New. Further Details. Sub Genre: Animated Feature. Genre: Children's. Title: Batman: Assault On Arkham. Condition: New. Language: English, Brazilian Portuguese, French, German, Latin Spanish. Sub Genre: Animated Feature. Genre: Children's. Alchemists are knowledgeable and naturally talented individuals who can manipulate and modify matter due to their art. Yet despite the wide range of possibilities, alchemy is not as all-powerful as most would believe. Release Date: 2015-08-03. Condition: New. Elfen Lied: Complete Collection Blu-Ray (2015) Mamoru Kanbe NEW Title: Elfen Lied: Complete Collection Leading Actor: Mamoru Kanbe Region: Region B Duration: 325 mins Format: Blu-ray / Collector's Edition Type: Blu-ray No. Gurren Lagann: Complete Collection - Blu-ray Region B Free Shipping! The episodes are: 'Bust Through the Heavens With Your Drill', 'I Said I'm Going to Pilot That Thing', 'Who Do You Think You Are, Having Two Faces? '., 'Who Is This Bro?'. 'Gurren Lagann: Childhood's End' (2008) is a feature length adaptation of the events of the main series. 5 out of 5 stars - Gurren Lagann: Complete Collection - Blu-ray Region B Free Shipping! 2 product ratings2 product ratings - Gurren Lagann: Complete Collection - Blu-ray Region B Free Shipping! Title: LEGO Batman - The Movie - DC Super Heroes Unite. When Lex Luthor (voice of Clancy Brown) struggles to gain public support during his presidential campaign he decides to team up with the Joker (Christopher Corey Smith), who can produce a special gas that will sway public opinion. Dirty Pair: Flight 005 Conspiracy. Movie/TV Title Dirty Pair: Flight 005 Conspiracy. Format DVD. Our specialized fields are in rare Japan. hard to find records and new Japan cds. Country/Region of Manufacture Japan. Lupin the Third: Plot of the Fuma Clan (The Fuma Conspiracy). Movie/TV Title Lupin the Third: Plot of the Fuma Clan (The Fuma C. Format DVD. Country/Region of Manufacture Japan. Our specialized fields are in rare Japan. ). Computer animated action movie featuring Marvel Comics superheroes Iron Man (voice of Adrian Pasdar) and Hulk (Fred Tatasciore). But can they learn to work as a team despite their differences?. 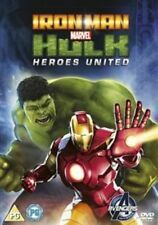 Zoom > Iron Man and Hulk: Heroes United [DVD]. Zoom > Sausage Party (with UltraViolet Copy) [Blu-ray]. Product Sausage Party (with UltraViolet Copy) [Blu-ray]. Duration: 89 minutes. ; 'The Booth'; 'The Great Beyond'; 'The Pitch'; 'Seth Rogen's Animation Imaginatorium'|Line-o-Rama|Outtakes. Iron Man and Hulk: Heroes United DVD (2014) Eric Radomski NEW Title: Iron Man and Hulk: Heroes United Leading Actor: Eric Radomski Region: Region 2 Duration: 68 mins Format: DVD / Normal Type: DVD No. Sausage Party Blu-Ray (2016) Greg Tiernan NEW Title: Sausage Party Leading Actor: Greg Tiernan Region: Region A,B,C Duration: 89 mins Format: Blu-ray / with UltraViolet Copy Type: Blu-ray No. UK Release Date: 26 Dec 2016 Edition: with UltraViolet Copy. Marvel's Iron Man & Hulk: Heroes United. Marvel makes cinematic history again with the most unexpected team-up in the universe! When Zzzax, a seemingly invincible, energy-devouring monster, threatens to destroy the planet, Marvels unlikeliest pairing of Avengers is mankinds only hope. Teenage Mutant Ninja Turtles: Earth's Last Stand/Super. DVD (2017) Ciro NieliTitle: Teenage Mutant Ninja Turtles: Earth's Last Stand/Super. Leading Actor: Ciro Nieli Region: Region 2, 4 Duration: 304 mins Format: DVD / Normal Type: DVD No. But can they learn to work as a team despite their differences?. Title: Iron Man and Hulk: Heroes United. Format: DVD. Condition: New. Language: English. Sub Genre: Animated Feature. Genre: Children's. 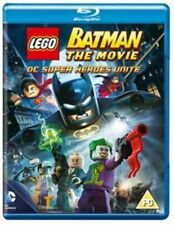 LEGO Batman - The Movie - DC Super Heroes Unite DVD (2014) Jon Burton NEW Title: LEGO Batman - The Movie - DC Super Heroes Unite Leading Actor: Jon Burton Region: Region ABC Duration: 68 mins Format: Blu-ray / Normal Type: Blu-ray No. Studio: High Fliers Films DVD Release Date: 3 Aug. 2015. Format: PAL. Classification: 15. Number of discs: 1. Iron Man and Hulk: Heroes United. Computer animated action movie featuring Marvel Comics superheroes Iron Man (voice of Adrian Pasdar) and Hulk (Fred Tatasciore). But can they learn to work as a team despite their differences?.